A tour across some of Cambodia’s best habitats for birds: Siem Reap, Tmatboey, Veal Krous, Okoki, Kampong Thom, Keo Seima and Kratie. Sight the Sarus Crane, Spot-billed Pelican, Bengal Florican, Giant Ibis, White-shouldered, White-winged Duck, Thickbilled Green Pigeon and many more birds on this exclusive birding trip! 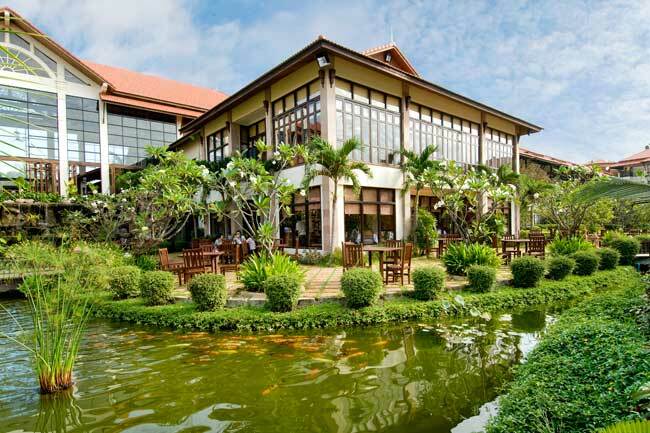 Your Cambodia birdwatching and wildlife tour begins with your arrival in Siem Reap where you will be met by our representative who will transfer you to your hotel.You can spend the rest of the day at leisure. You begin your day with a hearty breakfast and relax before you embark for an adventure filled day. After lunch,you will be picked up to start your birding experience. 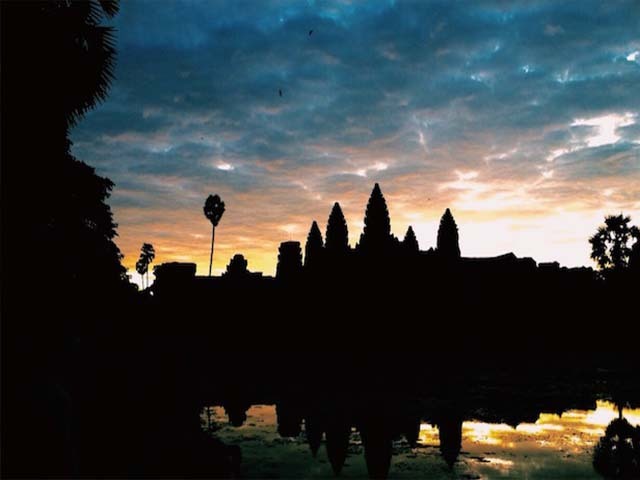 There is no better place to start the day than at Angkor Wat.The 200 plus temples which constitute the Angkor Great Park are truly a wonder of the world. Your guide will combine the trip to Angkor Wat with birding in the surrounding forest, which is at a short distance from Siem Reap.There is a chance of spotting the Oriental Darter in the moat, Hainan Blue, Taiga and Asian Brown Flycatchers, White‐throated Rock‐Thrush, Black Baza, Blue Rock Thrush, Forest Wagtails, Olive‐backed Pipit, Greater Racquet‐tailed Drongos, Asian Barred Owlets Coppersmith Barbet, Ashy Minivet, Yellow‐browed and Pale‐legged Leaf‐Warbler, raucous Red‐breasted and Alexandrine Parakeets and White‐crested Laughing thrushes. You can enjoy the sunset in the backdrop of the temples before heading back to town. Your day starts early as you leave for Chong Khneas, about 10 kms by road and transfer to a boat for the journey to Prek Toal. Depending on the lake water levels, the boat journey cuts through the flooded scrub surrounding Chong Khneas and a small band of primary forest lining the lake where the boat moors for breakfast. Later you will head to the core reserve for a WCS observation platform next to a bird colony. You can either have a packed lunch which will allow you to maximise the time spent bird watching or you can return to Prek Toal for a Khmer lunch in a floating house. A village tour by paddle‐boat can be organised before returning to Siem Reap. Today you will drive towards Tmatboey via Florican Grasslands to watch the Bengal Floricans.The critically endangered Bengal Florican and many other water‐birds are found in the grasslands around the Tonle Sap Lake. The ‘Wildlife Conservation Society’ has worked with local communities to set up Integrated Farming and Biodiversity Areas (IFBAs) to conserve prime florican habitats. 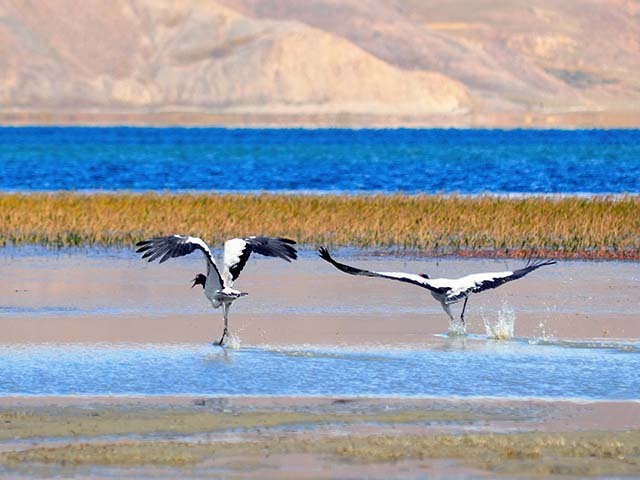 These bird watching trips provide income to the villagers who assist the Guide in locating the birds.The peak display time is between dawn and 9am and then again between 4.30pm and dusk. 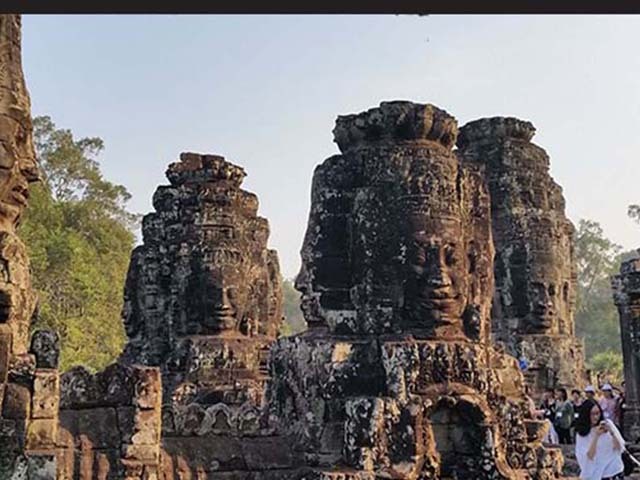 After visiting the Florican grasslands the group will visit the small town of Dam Daek and the temples of Beng Melea and and Koh Ker.You will stop at either one or both of these temples if time permits. You start the day a little early around 4.30am with a quick cup of tea or coffee, then a drive and a walk to less disturbed areas of forest where Giant Ibis have been located.After an eventful morning outing you will return to the lodge around 9am for breakfast. You can discuss with the Guide how you wish to spend the day apart from the sunrise and sunset birding. Packed lunches can be arranged if you want to spend more time in the forest and night drives / walks can be arranged to spot the owls and Savannah Night Jar. The village of Tmatboey is remote and self‐sufficient. We can organise an optional village tour, which takes in local trades as well as the school, a market garden and a distillery for sugar palm wine. You set out for your last birding experience in Tmatboey today morning. After breakfast, you make your way to Tbeng Meancheay the Provincial Capital of Preah Vihear Province and on to the village of Dongphlet in the Chhep Protected Forest where as part of WCS conservation program a vulture centre is set up to feed the 3 critically endangered species of vulture; Red‐headed, White‐rumped and Slender‐billed. You might get the chance for sunset birding perhaps catching a sight of Crested Treeswift, Black Baza, or Collared Falconet (if not already seen at Tmatboey). After breakfast you will travel approx 30 kms through increasingly remote dry deciduous dipteropcarp forest to the camp site at Okoki. The pools here provide habitat for the White winged Duck. This is one of the most pristine parts of Cambodia with a low population density so there is a possibility of sighting different mammals as well.Pileated Gibbon are regularly heard and occasionally seen and there are signs of Banteng, Sambar, Wild pig, Muntjac, Long‐tailed macaque, Fishing Cat and Leopard. Today you drive approximately 7 hours from Okoki to Kamong Thom. With the improved roads the journey time has been shortened which should allow for some bird watching enroute including the Tonle Sap Grasslands, this time further south around Kampong Thom. The road runs close to a significant pre Angkorian temple called Samboh Pre Kuk 30km from Kampong Thom, which offers an interesting nonbirding diversion. After an early rise and a last look at the flood plains near Kampong Thom you will transfer to Keo Seima in Mondulkiri crossing the Mekong River at Kampong Cham which offers a good lunch stop. From Kampong Cham the journey takes approximately 4 hours, which means a presunset arrival at the WCS Station just outside the small town of Keo Seima for walk through the adjacent forest. You spend the next two days doing birding walks in and around grasslands around Kampong Thom & the Seima Protected Forest (SPF) as well as the Southern Annamitic Forest. After birding along the trails around Keo Seima in the morning you will transfer to Kratie. 15 km North of Kratie are the Kampi Pools where the Irrawaddy Dolphin can be seen from a boat as well as the Mekong Wagtail (Moctacilla samveasnae, named after Sam Veasna). The river habitat is under threat from Chinese dams already constructed and proposed dams in Laos and Cambodia which if constructed will mean the dolphin along with other riverine bird species will become extinct from Cambodia. Today you will go for early morning birding where you might sight the Asian Golden and Streaked Weaver(the Baya Weaver is a sighting at ATT). Later after breakfast you will set off for the long drive back to Siem Reap which takes about 6-8 hours.